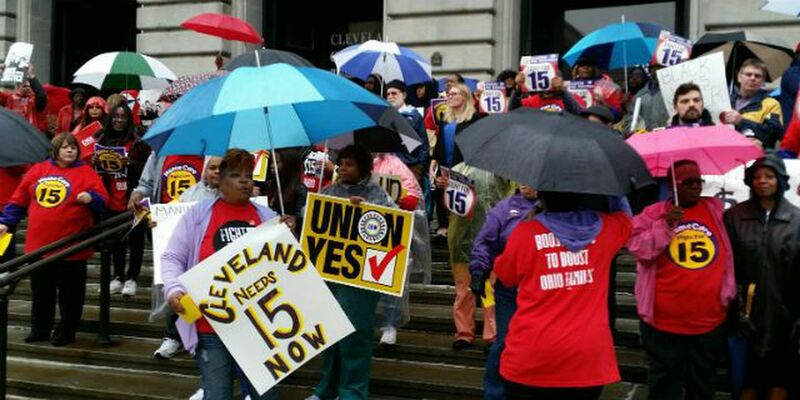 CLEVELAND, OH (WOIO) - Local home care workers, nursing home workers, library staff, school district employees, fast food workers, and child care workers throughout Cleveland protested outside of City Hall on Tuesday, joining minimum wage workers in 500 cities nationwide to demand that elected leaders stand up for $15/hour and union rights. Called "Fight for $15," this is the largest strike to ever hit America's fast food industry, with walkouts planned in a record 270 cities. The expansion of the Fight for $15 into the 2016 political arena marks the latest sign of the mounting political power of underpaid workers who launched their movement for higher pay and union rights in New York City three years ago. The demand for $15/hour is already starting to define the 2016 presidential race. Fight for $15's campaign encourages people to vote next year for candidates who support raising the federal minimum wage. A total of 46 percent of workers in America are paid less than $15/hour. There are 2.43 million workers in Ohio paid less than $15/hour.